Welcome to Miss May's Christmas edition, sharing my favourite things (mainly cute and tiny things) that I simply adore. Yes, I'm still obsessed with lapel pins and brooches especially the cute mint green Party Animal by Surfing Sloth. And, if you're a sensitive person like I am, the tear drop pin with Sensitive written all over it is the perfect gift! 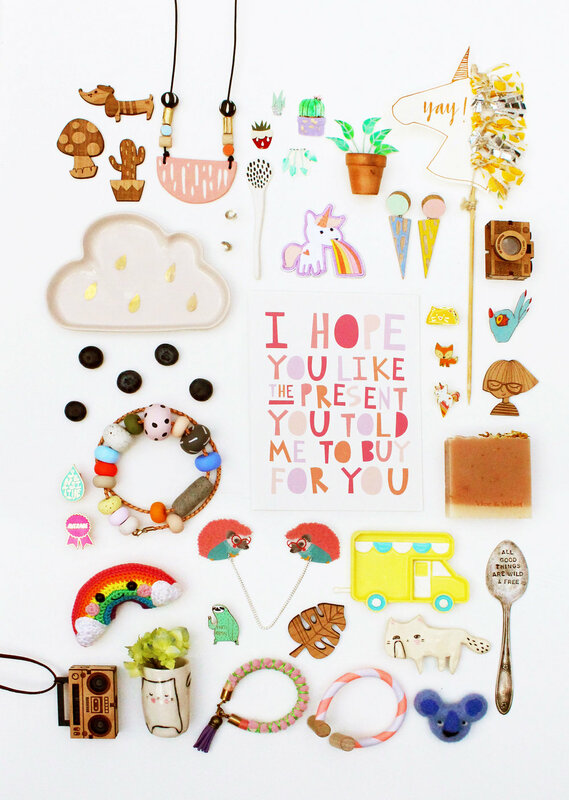 Cutest pins from Color Theory. And how cute are Whistleburg's Hedgehog clips. They make cute pins for sweater and collars. Now, I've been obsessing with handmade necklace and bangles on Etsy for the longest time. I'm a big fan of these Aussie girls, Rebecca Pocock of Maclatchy and Emily Green of Handmade by Emily Green. The prettiest handmade and handpainted beads you will find on Etsy. I'm also in love with my pretty bangles in stripes from Love Harthorne and pom poms by Love Astrid. Happy days! For something more delicate, I've got the sweetest ear studs handmade by Glacier Jewellery. If you're an 80s kid, you'll remember all the chunky cameras, big boom boxes, rainbows and unicorns (and don't forget, shoulder pads and bad hair days). Well, I've got the perfect Christmas gift for you. Little Confetti Love makes the prettiest unicorn cake topper around. And I have super cute Hello Miss May iron on patch and Unicone lapel pins (who needs ice cream when you have a Unicone?). Brainbow's Boom Box and Camera necklace are to-die-for. For something more bespoke and custome made, I simply adore House of Bec's silver spoons. My fave quote is 'All Good Things Are Wild And Free' and Bec customised that for me. Cherished it till this very day. I can talk all day but I'll leave you kids to the Christmas list. It's got all the info you need hehe. Below, are a list of makers and shakers with direct links to their websites. You can find more gorgeous gifts through the Etsy Editors' Pick's page. Have fun shopping everyone!